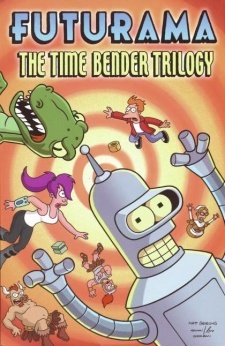 Futurama: The Time Bender Trilogy was the third paperback comic, this paper back consists of the four comics of the time travelling four part "Time Bender Trilogy", "Kickin' It Old School", "The Time Bender Trilogy: Part 1", "The Time Bender Trilogy: Part 2" and "The Time Bender Trilogy: Part 3". "Kickin' It Old School" Fry, Leela, Cubert and Bender are accidentally re-enrolled in high school. After triggering a supernova, they must help save the school from being destroyed. After saving the school and students, the crew arrives back on Earth, where they discover that everyone else has disappeared. "The Time Bender Trilogy: Part 1" The crew discovers that every other being on Earth has been transported back to the time of the dinosaurs. Cubert discovers three pieces of a time machine. The Professor has the fourth piece stuck in the past with him. 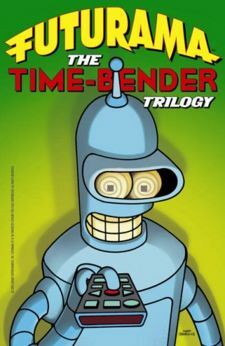 A twist of bad luck sees Leela, Fry, and Bender sucked through time with the other pieces of the machine. "The Time Bender Trilogy: Part 2" Leela is transported to Ancient Greece, where she must battle the Gods. Bender is taken to Salem, Massachusetts, where robots are burned at the stake, and Fry is taken to the 1910's, where Worlds War I is being held against the Omicron Persei Empire - all 27 planets. "The Time Bender Trilogy: Part 3" Fry recalls how he escaped a P.O.W. camp on Omicron Persei 8. Suddenly, Leela arrives and tells Fry how she was frozen in Ancient Greece, and that the piece of ice encasing her was used to make a nearby sculpture. Bender also shows up, saying that he led the industrial revolution. Suddenly, the three pieces of the time machine lead them to the fourth piece, in the Professor's jacket, currently in a museum. They put the machine together, are taken to the time of the dinosaurs, and rescue everyone on Earth by taking them back to the year 3000. All four stories are written by Ian Boothby. Currently the only Trade paperback with a continuous story. No Australian release of this trade paperback is scheduled.